This interactive guide addresses the basics of COBIT 5 framework, focusing on its’ principles, which enable building an effective and efficient governance and management framework. 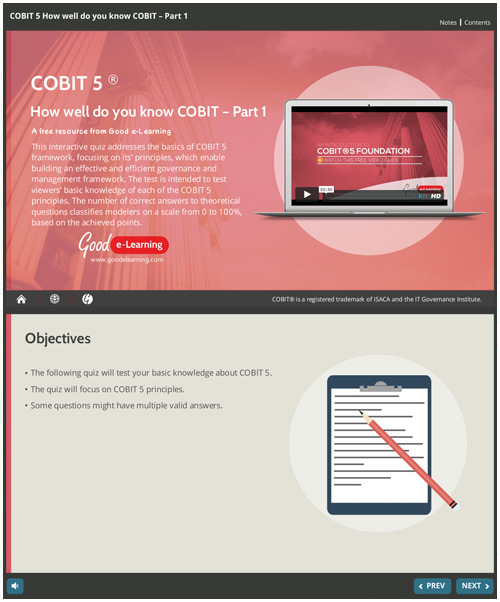 The test is intended to test viewers’ basic knowledge of each of the COBIT 5 principles. The number of correct answers to theoretical questions classifies modellers on a scale from 0 to 100%, based on the achieved points. Download this free COBIT interactive guide by our COBIT expert Gregor Polancic today and you’ll also get unlimited access to our entire library of 450+ Business and IT learning resources!